I am a 16 year old girl from Ohio who loves to write and draw. Although my artistic abilities are adequate, my musical abilities (or lack thereof) could be considered a crime against nature. I do, however, enjoy listening to music. A few of my favorite bands are Muse, Eels, the Beatles (of course), the Verve, and many more. My favorite movies are Gladiator, all four of the Rambo movies, Alice in Wonderland (the 1951 version), and The Book of Eli. My favorite books are Jane Eyre, The Neverending story, Alice's Adventures in Wonderland, and The Count of Monte Cristo. 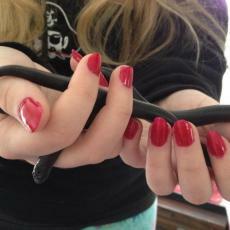 My most valued posession is, by far, my pet snake. His name, Vlademar, was given to him because of a famous, Danish king with the same title. I am the second oldest of four children, all of which are girls. Although my views do not always necessarily coencide with the modern church, I do claim Christianity as my religion. I love to debate with others, and believe that when this is done in a calm and respectful manner, it can lead to great educational benefits. This page was created in 1.4462 seconds.